A man has suffered serious burns in an explosion at a flat in Wiltshire. 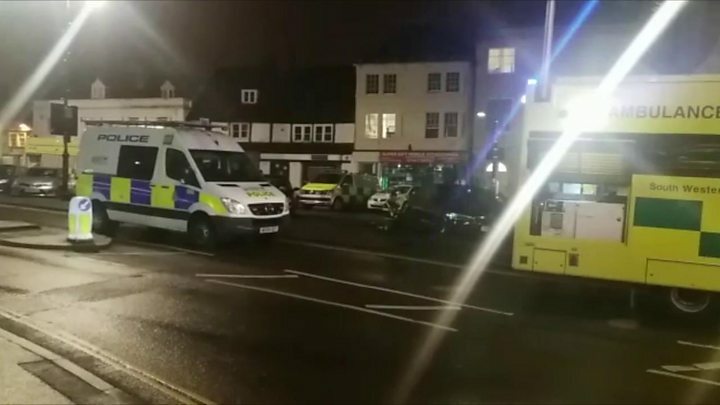 The blast happened in a third floor property in Chippenham's Market Place just after 18:00 BST. Nearby buildings were evacuated, and Dorset and Wiltshire Fire and Rescue Service said the property had suffered "significant structural damage". The cause of the explosion is not yet known and an investigation is under way. The man was taken to Southmead Hospital in Bristol but later transferred to a specialist burns hospital in Swansea. Volunteers from the British Red Cross supported those affected and temporary overnight accommodation was arranged for some residents. Image caption Large amounts of debris can be seen where the explosion took place. Supt Phil Staynings said the investigation was in the "very early stages". "We are working with the fire and rescue service and Wiltshire Council to secure the property, which has sustained significant structural damage," he said. "At this stage, we are unable to determine the cause of the explosion but our investigation will continue throughout the night. "We would like to thank local businesses who have provided refreshments, shelter and accommodation during the evening as well as volunteers from the British Red Cross who are supporting anyone affected." The cordon runs between St Mary Street, Market Place and Timber Street.